Despite the competition on the market, as there are more big manufacturers today that continually release new models into the market, Fujifilm remains strong, especially in the high-end class. For a mirrorless digital camera around a thousand bucks, Fuji X100T and Fuji XT1 are excellent choices. Both of them are available at similar prices, and both are heavily popular on the market. 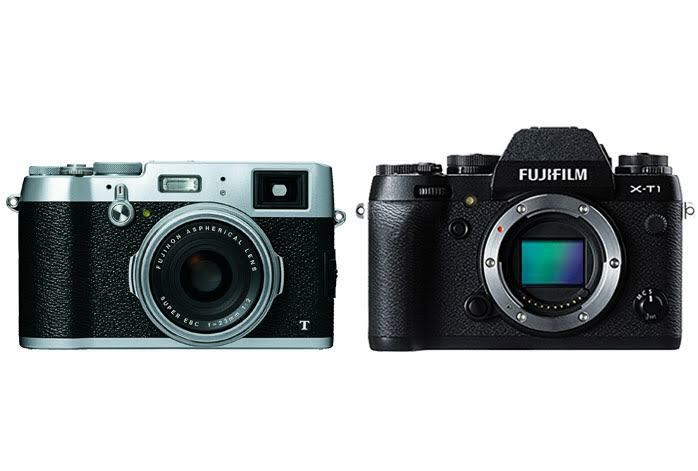 However, before you make a decision, you need to be aware that Fuji X100T and Fuji XT1 are very different from each other. They have each own distinctions. So, make sure that you make the right choice by continue reading the comparisons below! There is one crucial difference between Fuji X100T and Fuji XT1: the lens. Fuji X100T comes with a fixed, non-interchangeable lens. On the other hand, Fuji XT1 comes with an interchangeable lens system. Fuji X100T is not a clumsy camera by any means. Despite non-interchangeable, the F2.0, 35mm lens is configurable via the menu to be a 28mm wide-conversion lens or a 50mm tele-conversion lens. Furthermore, it features an inbuilt ND filter equivalent to 3-steps. The feature is able to reduce the amount of light down to 1/8, very handy in situations where the light is too strong but you need to shoot at a slow shutter speed without closing the aperture. Capture the flow of a river or the swaying flowers in a breeze with ease! Also, Fuji X100T comes with an internal flash. Now, if we talk about performance and image quality, Fuji XT1 stands on a better ground than Fuji X100T. Each of them is armed with the 16.3MP APS-C X-Trans II CMOS sensor. Hence, both of them can deliver similar quality images. In general, the images are well-defined, with excellent sharpness and details. Fujifilm cameras have always been famous for their excellent ISO performance, and this is true as well with both Fuji X100T and Fuji XT1. The colors are pleasantly solid and accurate. However, Fuji XT1 works faster than Fuji X100T. Fuji XT1 features faster startup and less shutter lag, allowing you to capture every view right away without missing any of the crucial moments. Fuji XT1 also has a faster photo burst, 8.3 fps, than Fuji X100T’s 6.0 fps. Its buffer capacity is also significantly larger. Last but not least, its display screen is tiltable, allowing for shooting at tricky angles. Talking about the fullest value for your money, Fuji X100T is certainly a great choice. Having an inbuilt lens system that is very reliable, flexible, and versatile already, you won’t have to spend more bucks for getting additional lenses. However, for sports and fast-paced photography, or if you prefer an interchangeable lens system, Fuji XT1 is the way to go.